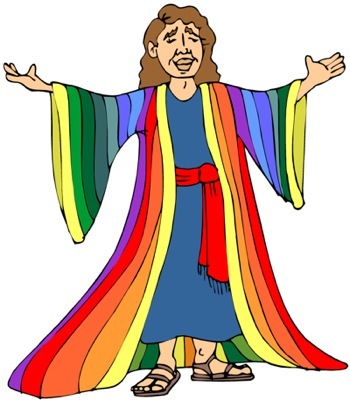 In this bible story Joseph is undeniably Jacob's favorite son, receiving extra love, attention and presents, including a coat of many colors. Joseph is proud of his coat and shows it off in front of his brothers. They, in turn, get upset and jealous. Joseph wakes up one morning from a dream in which the sun, the moon and the stars bow down to him. He retells his brothers the dream and claims that one day he will be a great leader and they will all bow down to him. The brothers then resent Joseph even more. Later, Joseph has another dream where eleven bushels of wheat bow down to him. He interprets this dream similarly to the first dream. In their spite of Joseph, his brothers Simon and Levi plot to kill him. The eldest brother Reuben suggests throwing him into a pit instead, and they do so. While in the pit, a group of travelers on their way to Egypt walk by. The brothers proceed to strip Joseph of his precious multicolor coat and sell him as a slave to the travelers. Afraid of returning home without Joseph, the brothers decide to lie to their father. They smear goat blood on the coat and bring it to Jacob. They tell him that Joseph was killed in the field. Jacob is devastated by the news and mourns the 'death' of Joseph. I use this story to discuss the virtue of truth. 1. Joseph was telling the truth about his dreams even though his brothers did not like his interpretation. Sometimes the truth hurts so we do not want to hear it. But the truth is something we cannot avoid - true facts remain. It is our job to find the right ways and proper tools to deal with the truth. 2. The brothers lied to their father and caused him a great deal of pain. Lies hurt. Therefore, it is always better to tell the truth even if it means admitting to doing something wrong. 3. The brothers acted impulsively at a moment of anger and jealousy. Does it ever happen to you that you act on an impulse and then regret it? It is always better to slow down and think before you act. Some things are difficult to undo once they are done.